An interesting demonstration of how planking and other wood working used to be done using steam and vintage machinery from down the years. There will also be an extensive collection of vintage tools on display. There will also be rack saw demonstrations through the day. The rack saw was used to saw up large tree trunks to provide a source of timber. The rack saw differs from a conventional saw bench in that the large trunks are held on a carriage and the whole carriage moves along on rollers. The blade would have been driven from a fairly large portable steam engine or traction engine. There will be demonstrations on a Wade Dragsaw, used for forestry logging around 1923. These will be timed demonstrations throughout the weekend, cutting circular discs 3/3ft in diameter and 2-3 inches thick. The discs will be available for sale and are ideal for making table tops. And here’s how it’s done today! 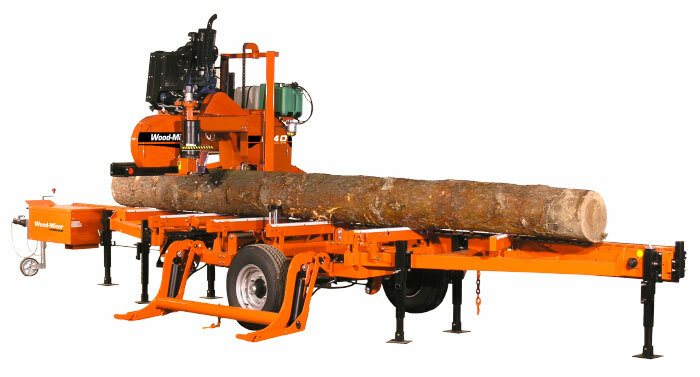 Wood-Mizer UK will be demonstrating a Mobile LT20 sawmill, capable of cutting 80cm diameter logs, 6.1m long. Wood-Mizer are the industries leaders in narrow band technology, allowing greater recovery from each log, whilst reducing capital outlay and running costs. The mill attachment consists of a pair of rails which are attached to bar of the chainsaw. The rails ride on a plank and then a previously cut surface and guide the chainsaw blade through the log at a consistent depth so that planks of a predetermined thickness are cut. The distance between the rails and the bar determines this thickness and it can be adjusted by moving the rails along a post at each end of the mill attachment. During use it is important that the rails extend out past the ends of the log so the cut has support the entire time. Small mills use a single chainsaw and can be handled by a single operator. Larger mills use two chainsaw power heads, one on either side of the attachment and these require two operators. This larger style of mill requires a special bar which allows the two chainsaw heads to be attached at either end. The width of the plank that can be cut is determined by the length of the bar, up to 34 inches (86 cm) so for logs having a large diameter, the longer bar is necessary. Also a special chain is designed to make rip cuts rather than the usual chainsaw chain which is for cross-cutting.